TS Corporate Colleges Free Intermediate Education-Scheme Details. 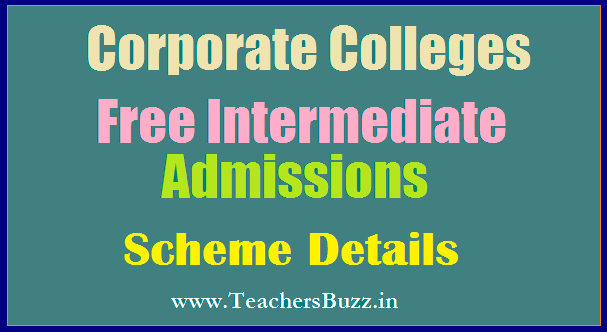 Free Intermediate Edn in Corporate Colleges for BC/SC/ST/Min 10th Class Students-Scheme Details-Scheme Details in AP and TS States- Admissions into Corproate Intermediate Colleges in AP and Telangana- Complete Scheme Details. Free Intermediate Education with Eamcet Coaching in Corporate Colleges for Meritorious BC/SC/ST/Minority 10th Clsss Students-Scheme Details in AP and TG States-Complete Scheme Details,Free Intermediate in Corporate Colleges for BC/SC/ST/Min 10th Class Students. Corporate Colleges Admissions Details. G.O.Ms.No. 235 Dated: 28-03-2011. Govt is offering applications for Free 2 Years Intermediate Education with Eamcet Coaching in Various Corporate Colleges like Narayana, Sri Chaitanya etc., in Andhra Pradesh and Telangana States for BC/SC/ST/Minority SSC Merit Students who have secured more than 7.0 GPA for 2018-19. Govt is offering applications for Free 2 Years Intermediate Education with Eamcet Coaching in Various Corporate Colleges like Narayana, Sri Chaitanya etc., in Andhra Pradesh and Telangana States for BC/SC/ST/Minority SSC Merit Students who have secured more than 7.0 GPA in March 2019. The Students have to apply through epass.cgg.gov.in Website for obtaining or reserving their seat in the Corproate College. They will give Free Intermediate Education for 2 Years. Free Intermediate Education in Corporate Colleges for Meritorious BC/SC/ST/Min Students Govt has issued Guidelines for Corporate Intermediate Education for Meritorious BC/SC/ST/Minority 10th Class Students through G.O.Ms.No. 235 Dated: 28-03-2011. 1.orders were issued according permission to implement the scheme of providing access to quality education to meritorious poor students belonging to the SC/ST/BC/MW communities who have secured more than 400 marks in the SSC examination in reputed colleges in the private sector at the Intermediate level, to enable them to compete in competitive examinations such as IITJEE/ AIEEE/EAMCET, to secure seats in premier medical and engineering institutions. Under the scheme reputed private colleges have been identified and students selected from all the 22 Rural Districts through a District Selection Committee. Selected students are then sent to the reputed colleges as opted by students. The total fee payable is Rs.38,000 per student, of which Rs. 35,000 is towards tuition fee and Rs. 3000 is towards pocket expenses of the student. 2. The scheme was started by the Rural Development department in the Academic year 2008-09. Of the 8000 students admitted, 7477 students who remained on roll at the end of the second academic year were funded from out of SERP funds. The Rural Development Department has requested the relevant welfare departments to fund the scheme from the year 2009-10 onwards. The Rural Development Department continues to conduct the selection process and send students to the reputed colleges. As the academic year 2010-11 was fast approaching, the Rural Development department has selected 5500 students for the financial year 2010-11 based on the recommendations of the Group of Ministers, Vide reference 3rd Cited and commenced the admission process in private reputed colleges to enable students to join the institutions in time. 3. From the Academic year 2010-11 admissions shall be provided each year for 5500 meritorious rural students who have secured 400 marks (Now it is changed as 7.0 GPA) and above at the SSC examination, from the SC/ST/BC & MW communities, in reputed junior colleges in the private sector, with a view to enable them to compete in competitive examinations such as IIT, AIEEE, EAMCET, etc., to secure admissions in premier engineering and medical colleges. 4. Students eligible under this scheme shall have secured a minimum of 400 Marks in SSC examination and will be selected strictly in order of merit by a District Selection Committee at the District level. (Now the 400 Marks changed as 7.0 GPA). 5. The maximum admissible fee under the scheme is Rs 35,000 per annum per student towards, fee, Books, Material, Mess and other maintenance charges. The fees under this scheme shall be fixed by the District Collector keeping in view the facilities and prevailing market prices for students studying at the college. This fee will be paid to the College Account. 6. In addition to the tuition fee students shall be eligible for an amount of Rs.3000/- towards pocket allowance and maintenance charges. (This amount will be paid to the Students Bank Account). 8. Out of the seats allocated to Minority Welfare, 80% will be allocated to Muslim & 20% to Christian, Buddhism & Sikh. 60% of the total allocation shall be reserved for girls and 40% for Boys. (ix) At least 3% against each quota may be reserved for the Handicapped.